One of the most interesting varieties from a developmental standpoint is the black and white, scale-less Kumonryu. It comes from a long line of koi beginning with a dark-colored magoi variant called a Tetsu Magoi. From crosses with this koi many years ago an all black koi was developed called a Karasu (crow). Some of these koi had white fin tips, which were singled out and further cross-bred to create koi with more and more white. Eventually a black koi with a white head and white fins was developed called a Yatsushiro. 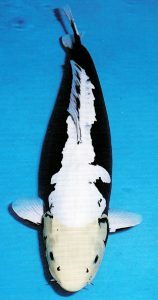 The first kumonryu, which is merely a doitsu (scaleless) version of a yatsushiro, was created when a shusui (doitsu koi with red lateral markings and a bluish body color) was crossed with a yatsushiro. One way to tell a kumonryu from a doitsu shiro utsuri (also a black and white scaleless koi) is to look closely at the white skin. A kumonryu will have a bluish tint, inherited from its shusui parent. The other difference between the two is the genetic tendency of the sumi (black) to appear as a wrapping pattern on Utsuri, while it appears more as a lateral-type pattern (running lengthwise) on Kumonryu. 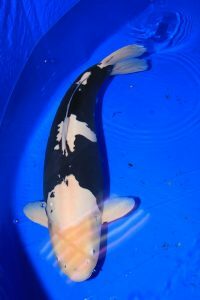 From the first kumonryu many breeders have developed variations in the patterning, including some truly spectacular specimens reminiscent of a killer-whale type of pattern. The problem is, these koi have a nasty habit of changing colors from season to season (black becomes white and white becomes black!) and also changing their patterns from year to year, so that you may not even recognize your own koi if you don’t watch it closely! For this reason, it is difficult to select a baby kumonryu. They tend to develop more black as they mature, so some hobbyists recommend purchasing predominantly white babies. If you really want to increase your chances of getting a good specimen, and your budget and pond can handle it, perhaps purchasing two or three of them would make sense. These koi are a lot of fun to own and provide endless fascination as they change their patterns from season to season and from year to year.